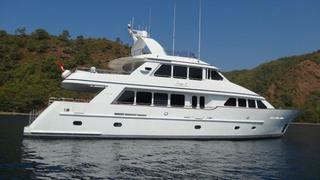 More news now from Eliad Hagiladi at Yacht Marine in Turkey that he has the 27m motor yacht Escape S for sale. Escape S was built to Lloyds class by Poland's Conrad yard in 2005 with exterior styling by Dixon Yacht Design. MCA compliant, her interior in high gloss cherrywood accommodates eight guests in a master suite, VIP stateroom and two twin cabins. Powered by twin 600hp Caterpillar engines she has a range of 3,000 nautical miles at a cruising speed of 12 knots. Escape S is asking €2,500,000.